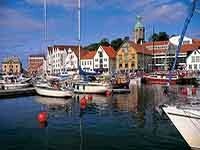 Stavanger is called the most beautiful city in Norway, as well as its cultural capital. There are many theaters and museums here. The Stavanger House of Culture is considered a work of Scandinavian architectural art. 50 years ago, in Stavanger, oil was found, and now it is also the richest city in Norway.